If you're interested in serving our bread, sell our bread, or would like to know more about our offering, please send us a line. Now you can visit us at our bread kitchen. The Nº 01 Sourdough is our house loaf; this classic sourdough is the foundation of our range. The long cool fermentation period produces a loaf that is mildly sour in flavour while the high levels of hydration allow us to bake it a little longer, providing a thick and blistered crunchy crust. We're working on something good. Being big on seed & grain makes our No 03 loaf not only wholesome but full of malty, chewy, popping texture and flavor. Sandwich it, toast it, enjoy it. For our Sultana loaf we use our house dough, add golden sultanas, toasted fennel and coriander seeds and a healthy portion of orange zest. The result is a bright and versatile sourdough that's perfect toasted and served with fresh butter. 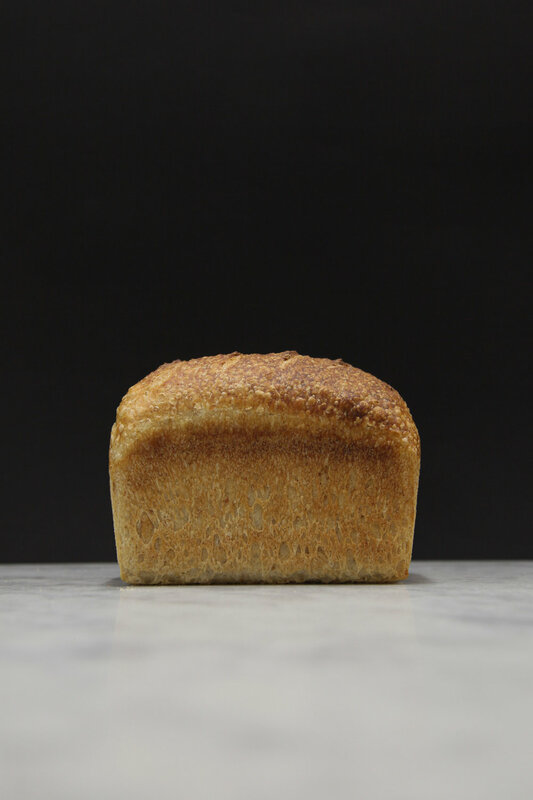 We love our Nº 05 sourdough Square Loaf for its mildly sour flavour, moist tender crumb, thin easy slice crust, and the fact it’s the perfect shape for your toaster.